Hiroshima is a very special city. We decided to go there for a couple of days mainly to learn more about its horrendous history and the impact the atomic bomb had on the population. However, I left with a much more positive feeling about the city then when I arrived. Our first stop in the city was the Peace Memorial Park where you can find the Atomic Bomb dome, the Peace Memorial museum and several monuments. The items they have on display in the museum are really confronting and shocking, and give you an idea of the impact the bomb had on the city and life after the war. 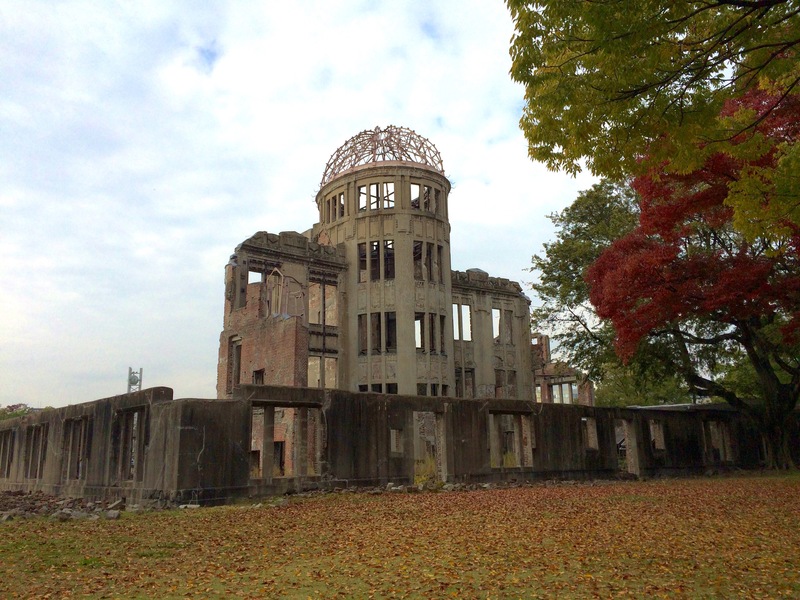 I personally think you have to visit the museum when you go to Hiroshima, because the war is an unavoidable part of the city's history and it also explains the positive vibe you find in Hiroshima today. The peace park is a really beautiful and calm place with lots of trees and several monuments. I was personally most impressed with the Children's Peace monument, which was made for a little girl, Sadako Sasaki, who was 2 years old when the bomb was dropped and died of leukaemia when she was 11. Sadako wanted to fold a thousand cranes, the symbol of happiness and longevity, in the hope that this would help her recover. She died before she finished, but her classmates folded the rest of the cranes for her. Today, the monument, which portrays Sadako holding a big crane, is surrounded by colourful paper cranes folded by school children from all over the world. The beautiful thing about the memorials and the peace museum in Hiroshima is that the main focus is on how we have to make sure that we make peace and nothing like the disaster in Hiroshima will happen again. On our second day we went outside of the city to visit the famous Torii gate in Miyajima. It's one of the most popular tourist attractions in Japan and so we were definitely not the only ones on the small island. The torii (shrine gate) is built in the water and when the tide is high it's as if the torii is floating. The island is inhabited by wild deer that are quite curious and walk around the same sites as the tourists hoping to be fed delicious treats. One of the many tasty things you can find on the island are momiji manjū, soft cookies filled with paste in lots of different flavours. In some shops you can even see how they are made. We also visited the Daisho-in Temple where we saw some spectacular autumn foliage. It's a Buddhist temple and there are lots of statues and other religious objects to see. For example, along the stairs there is a row of spinning wheels inscribed with Buddhist sutra and it's believed that spinning the inscriptions has the same blessing effect as reading sutra. Back in Hiroshima, we spent some time in the colourful covered shopping streets and had dinner at Okonomi-mura, a building with 26 small restaurant spread over three floors. Each restaurant has a couple of seats around big hot plates on which the cooks prepare your food. Their specialties are oysters and Hiroshima-yaki, a local version of okonomiyaki, which has noodles as its key ingredient. My next post will be about the last stop on our trip: Okinawa, the Hawaii of Japan!